The National Criticality Experiments Research Center (NCERC) is located at the NNSS and operated by the Los Alamos National Laboratory (LANL). NCERC maintains a substantial special nuclear material (SNM) inventory and expertise to support a variety of nuclear security missions, including nuclear criticality safety research and training, nuclear emergency response, nuclear nonproliferation, and support for other government agencies requiring hands-on access to significant quantities of nuclear material in numerous configurations. Operations conducted at the NCERC include both subcritical and critical experiments with the ability to measure a wide variety of nuclear properties to meet sponsor needs. The NCERC originated as the Los Alamos Critical Experiments Facility (LACEF) located at TA-18 at LANL in New Mexico. The capability originated during a time of national crisis to support the development of nuclear weapons. Subsequently, the work at LACEF contributed to a full range of programs involving applications of nuclear energy, basic measurements of nuclear parameters, kinetic behavior of chain reacting systems, nuclear weapons safety, detector development, and nuclear criticality safety. Later, important program activities in nuclear emergency response, arms control, and nuclear nonproliferation were undertaken. As a result of the extensive inventory of SNM and the resulting requirements for physical security and operational safety, it was decided to relocate LACEF to the Device Assembly Facility (DAF) located at the NNSS and was renamed to NCERC. science support to other government agencies (i.e., NASA, Defense Threat Reduction Agency, etc.). 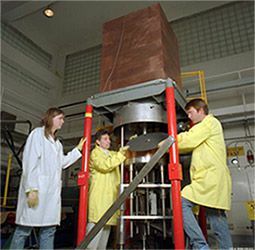 The experiments at the NCERC use a variety of nuclear materials ranging from small neutron-emitting sources for radiation-detection equipment to larger quantities of uranium and plutonium for criticality experiments. Included in the mission portfolio are four critical mass assembly machines that operate at essentially zero power (less than a Watt), as opposed to commercial nuclear reactors that operate at thousands of MegaWatts. These criticality assembly machines are named Godiva, Flattop, Planet, and Comet. As one of the major training facilities for DOE personnel, the NCERC’s principal operation is to conduct research in the design, development, construction, and application of experiments on nuclear criticality. NCERC contains the largest collection of nuclear critical mass assembly machines in the western hemisphere. These assemblies can be broadly categorized as “benchmark critical assemblies,” “general-purpose assemblies,” and “fast burst assemblies,” which were designed to accommodate a broad range of experiments. Godiva is a bare metal uranium fast burst assembly designed to provide an intense burst of neutrons during an extremely short pulse. Flattop is a unique fast-spectrum assembly used for cross section testing and training. Planet and Comet are general purpose vertical assembly machines designed to accommodate experiments where neutron multiplication is measured as a function of separation distance between experimental components. Fuel materials include uranium, plutonium, and neptunium. The NCERC cadre of personnel, in collaboration with Sandia National Laboratory and LLNL, teach a two-week classroom and hands-on nuclear criticality safety training class for criticality safety engineers and nuclear-material handlers. Combining their expertise and nuclear material inventory, the NCERC staff is able to create assemblies used to develop, test, and validate emergency response equipment, methods, and diagnostic procedures. These assemblies are used to train emergency response teams. Part of the NCERC mission is to provide the technology to enable the Nation to respond to the threat of nuclear proliferation. These technologies provide the verification of declarations made by other nations concerning their nuclear material stewardship. Another key to countering the proliferation of nuclear weapons and terrorism is in developing and evaluating equipment for and training of law enforcement and first responder teams. Training objectives often require the use of a range of actual nuclear materials all in one location. The ability to configure nuclear materials into mock-ups supports the development and validation of instruments and methods used in nuclear nonproliferation work. NCERC’s greatest resource is its expert staff with extensive hands-on professional experience in nuclear materials measurement instrumentation. The staff's ability to communicate technical concepts and share expertise with peers, nontechnical colleagues, and students contributes to its success. This has fostered strong working relationships with other national laboratories, the DOE, other U.S. Government agencies, private industry, and international organizations.